This easy, colorful meal is roasted in a parchment-paper-lined pan to avoid the need for added oil. We garnish the finished dish with cilantro and pine nuts, but a combination of basil and almonds or sunflower seeds and parsley would be delicious as well. Preheat the oven to 400°F and line a 9×13-inch baking pan with parchment paper. Place carrots, bell pepper, tomatoes, onion, garlic and 1/8 teaspoon of the salt in the pan and toss. Bake in the top third of the oven until vegetables are tender, about 25 minutes. 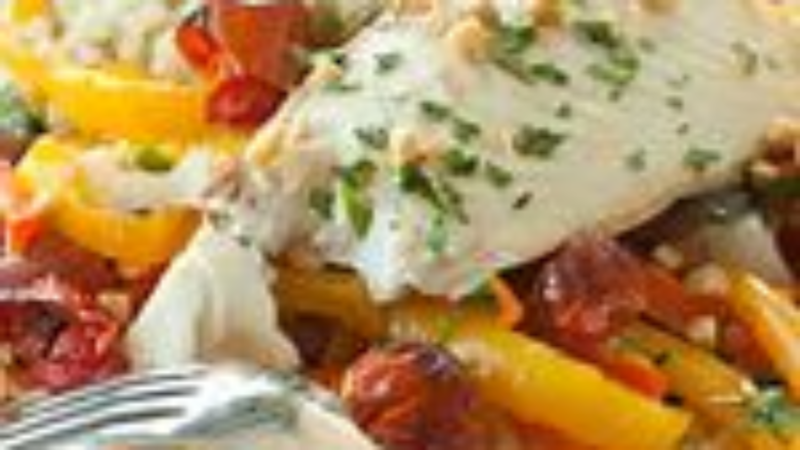 Stir vegetables, arrange fish on top and sprinkle with remaining 1/8 teaspoon salt, lemon zest and juice and bake until fish is just cooked through, 15 to 20 more minutes. Transfer fish and vegetables to plates or a platter along with quinoa and sprinkle with cilantro and pine nuts. Recipe and photo courtesy of Whole Foods.